The largest of our chapels was designed with a variety of uses in mind. It can be used as a chapel of rest, a family meeting room or as an informal service chapel. The idea of our service chapel is for the use of those who perhaps have a small family group, perhaps do not want a full religious funeral service or simply do not want to travel to have a simple service at the nearest crematorium. 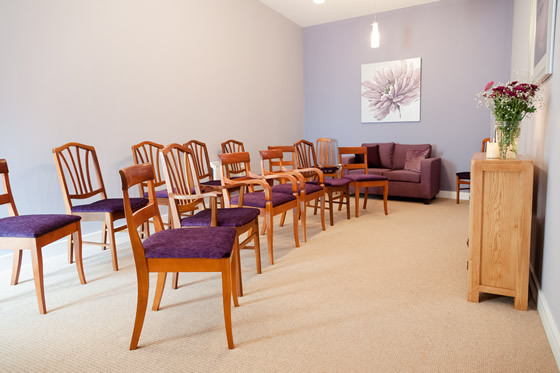 In our comfortable relaxed service chapel you can, at a mutually arranged time, have a simple service taken by the person of your choice or just simply yourselves as a family, you can have the chapel for as long as you need. You are welcome to bring in personal items, photographs etc., arrange the furniture as you wish and we can arrange floral tributes to be delivered and arranged as you want. Our main idea is to make the service as personal and as relaxed as possible. We can then travel to the crematorium ourselves afterwards at a later mutually agreed time. You are welcome to visit our service chapel at any time.